By no means am I implying the book was not good, or even less entertaining than usual. 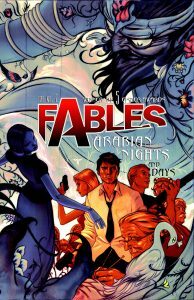 But Arabian Nights (and Days) did something more to the Fable series than merely define the very model of a transition book; it actually made me think that Bill Willingham doesn’t have a solid road map for where his series is going, anymore. I mean, he spent time establishing Fabletown and its history, and then there have been important storylines in the fields of romance, politics, and the war against the Adversary. So it’s not like I really know enough at this juncture to say that the sudden influx of the Arabian fables (including Sinbad, the ubiquitous evil magician with a pointy beard, and all manner of harem girls) marks a directionless grasp at new plots. It could well be merely another foundational introduction to the people who will be important in the next phase of the story, now that part one has been so firmly established. The fact that the political scene was still as solid as ever and that the last couple of issues gave us a brief look into the Adversary’s side of the war leave me hopeful that this was nothing less than the transitional book it certainly was. This entry was posted in Words and tagged fantasy, graphic novel on January 28, 2010 by Chris.